Persuasion – Most campaign resources go into persuasive messaging. How should online advertising be part of the media mix? Learn how pre-roll ads, in-banner video, rich media, and precision targeting are helping to support persuasion efforts – and providing new options for consultants who want to win. Fundraising – Barack Obama and John McCain raised ¾ of a billion dollars from online donors, but campaigns at every level can successfully leverage online fundraising. Learn the latest trends and techniques from those pioneering online fundraising best practices for local, regional, and statewide campaigns. GOTV – In the final hours of an election, digital media is the most frequent contact point with voters. Digital tools help you deliver the GOTV message directly and can aid in-the-field organizers and supporters. Don’t miss an opportunity to learn how you can push your vote total higher with online and mobile GOTV programs in the final 72 hours. Want to see us in Austin? Hurry up and register now. 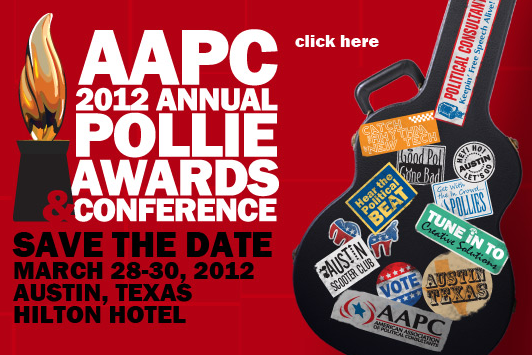 Tagged aapc, google, politics, pollies, texas, twitter, youtube.